The Hudson Bay Store Museum concept includes the rehabilitation and adaptive reuse of the existing 1923 Hudson Bay Building, display of original artifacts, and preparation of interpretive displays. 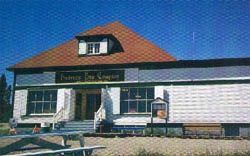 The Hudson Bay store has had an important role in the development of the community. The exterior storefront has been rehabilitated and all existing architectural features have been maintained. The original Hudson Bay sign has been restored. Investigation of original colors and finishes had been explored to produce a high level of authenticity. The exterior treatment included partial reconstruction of the original boardwalk (in front of the store) and exterior signage identifying the building in the context of the site as it may have existed in the community circa 1923. The store has been interpreted through the heritage character of the building and interpretive displays. Trapping artifacts and associated artifacts such as domestic and trades artifacts, are displayed in the store. The store has the advantage of being able to display a range of varying artifacts in context while providing an opportunity for interpretive displays in appropriate locations. The interior has been organized such that other themes may be represented in association with the major theme. The Labrador Heritage Society has established a souvenir shop in the store which is compatible and supportive of the overall concept. Admission: $2. per person, $1 for children 12 and under. Group rates available.